Who ever said plant biology was boring? Certainly not me after shooting this video. When I shot this video I didn’t realize I was witnessing an intimate relationship between flower and bee. The pistil is still showing here, but in the video, the petals clamp shut soon after the bee moves on. The flower provides the nectar to attract the bee. The bee lands on the flower, pulling the petals apart to reveal the pistil. 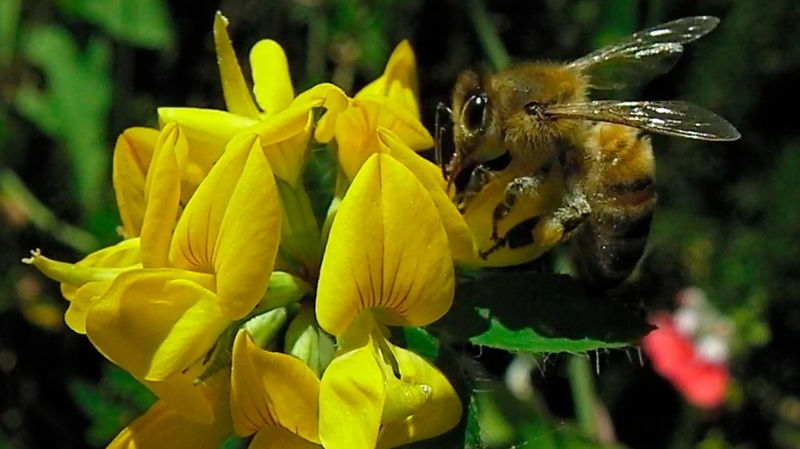 The flower makes pollen available which the bee carries away. Thank you Sweet Thunder for the sweet music. The video shows the bee and flower cooperation. I never took biology in school, so I don’t know if they show this racy stuff, but this is an unrated Bee movie in the truest sense. I was unsure what this blossom was. I thought it might be a yellow vetch, so I asked Morris Ostrofsky. 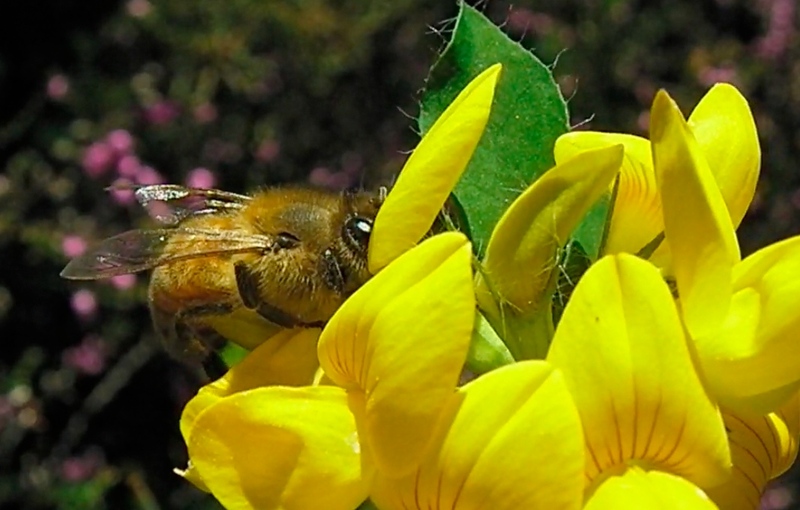 Morris, a forty year beekeeper and scientist affiliated with the Oregon State Master Beekeeping Program positively identified this blossom as a Bird’s Foot Trefoil. Music definitely helps the bee go about his business. Congratulations on the 100th post. Pat, this is so cool! I couldn’t watch the video until today…love the music and the text additions! on September 22, 2013 at 3:39 am | Reply Arthur in the Garden!